I have to ask Heather Baron-Gracie, the frontwoman of the Manchester band Pale Waves, about her image. Finding a genuine goth in pop music these days is near, if not completely, impossible and I would feel remiss if I didn’t ask what spurred this stylistic choice. Not only do these two influences inform Baron-Gracie’s style, but it’s apparent to anyone that has listened to My Mind Makes Noises, the band’s debut album, that they make up the backbone of their music. Pale Waves make pop music – and not some sort of low-key, indie pop either – the band is making pop with an eye on the charts, arenas, and festivals. Behind the Hot Topic makeup and ominous blood-red font of the record’s cover lies a bevy of anthemic, gossamer tunes that could slot into a playlist next to the likes of alternative stalwarts like, Vampire Weekend and Friendly Fires, or a major pop act like Taylor Swift. Fellow Mancunians the 1975 were huge proponents of the band in the early going and it’s easy to see why. Both bands seamlessly blend synthy new wave with massive pop choruses. 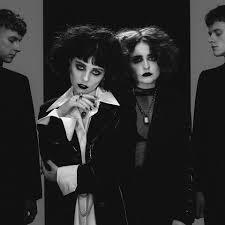 Songs like “There’s a Honey” and “Television Romance” bristle with the same nervous energy that has made the 1975 into one of the biggest bands in the world – a path which Pale Waves are trying hard to follow. Though there might be slight sonic differences between the new EP and My Mind Makes Noises, Baron-Gracie wants to make sure the two projects are tied together by what she considers to be strong, emotionally potent lyrics. Mental illness and hot-and-cold relationships are constant sources of inspiration for the 23-year-old. “Some days I can be fine and other days I can be in a terrible state of mind, but when I feel like that that’s when the best songs are created. I’ll second guess myself and panic. I’ll wonder if I’m good enough to be doing this or if I can keep on doing this. It’s an image thing as well. I need constant reassurance. I need people to show that they care and that they have love for me,” she says before adding that she knows that it’s quite a strange thing to crave. Though the songwriting process and touring can be extremely taxing, Baron-Gracie says it’s also the most rewarding thing she’s ever done.